Linux is very flexible, but the amount of power it puts at your disposal can sometimes be overwhelming. These quick tricks for your Linux desktop will give you something you can put to use immediately. Whether you’re a power user looking for a faster way to run commands or get to the terminal or a new user looking to squeeze some more power out of your Linux desktop, you’ll find a trick here for you. On Linux, you basically have two separate clipboards – there’s the traditional clipboard you can use with the Cut, Copy, and Paste operations (or the Ctrl+X, Ctrl+C, and Ctrl-V keyboard shortcuts). There’s also another sort of clipboard – when you highlight some text with your mouse, this text is copied to a special buffer. When you middle click in a text entry area, a copy of the text you highlighted is pasted into the text entry field. If you want to run a command without pulling up a terminal, use the Alt+F2 keyboard shortcut to reveal a Run dialog. This works in the majority of desktop environments including Ubuntu’s Unity, GNOME, and KDE. Type your command into the Run dialog and press Enter to run it. This is different from pressing the Windows (or “Super”) key and typing the name of a program, which searches for and launches graphical applications. Linux distributions generally provide you with multiple virtual consoles. One of these consoles runs your X server – the graphical desktop environment – while the other ones run traditional text consoles. You can switch between the virtual consoles by pressing the Ctrl+Alt+F# keys – for example, Ctrl+Alt+F1 will take you to the first virtual console. Ctrl+Alt+F7 generally takes you back to the console with the graphical desktop, although this can vary from distribution to distribution. 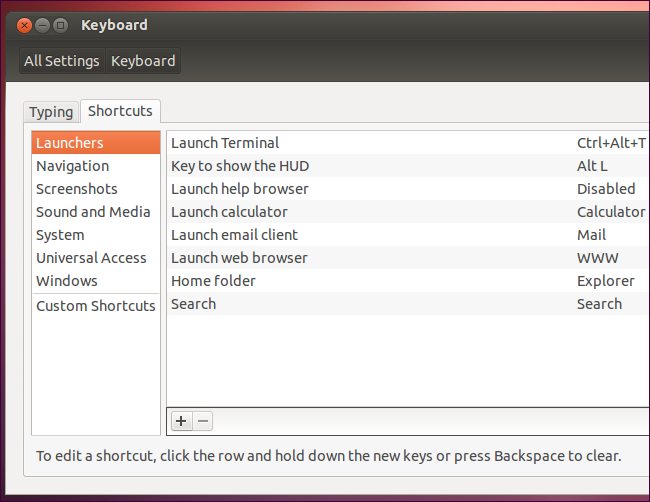 Using the HUD (heads-up-display) in Ubuntu’s Unity desktop, you can quickly search for and activate menu items with only your keyboard. 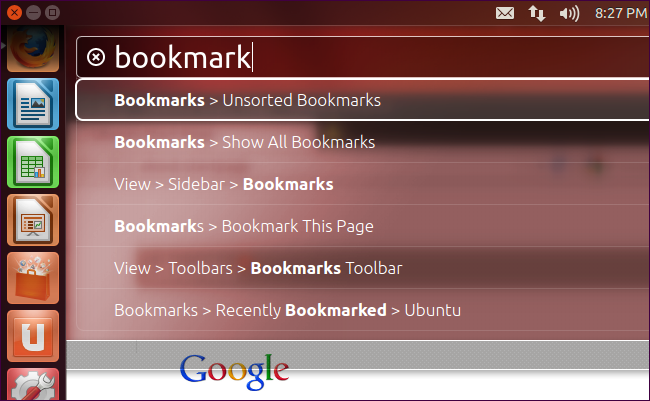 Press Alt and type the name of the menu item you want to activate – for example, if you’re using Firefox and want menu items related to bookmarks, press the Alt key and type bookmark. Use the arrow keys and Enter key to activate a menu item. 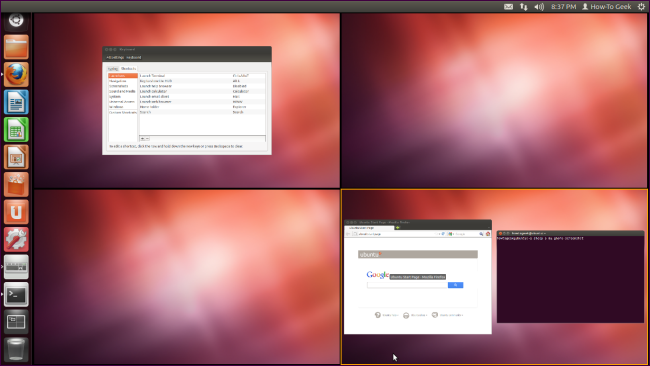 The HUD was introduced in Ubuntu 12.04. If you’re a Linux user, there’s a good chance you regularly use terminals. To quickly open a terminal on Ubuntu’s Unity or GNOME, press Ctrl+Alt+T. You can customize this keyboard shortcut, view the default keyboard shortcuts, and create custom keyboard shortcuts in your desktop environment’s Keyboard configuration window. In many desktop environments, you can even create a custom keyboard shortcut that executes a custom command or script when pressed. Click the Workspaces button or applet on your panel to switch between workspaces or view an overview of them. From here, you can often drag and drop windows between workspaces. Right-click a window’s title bar and use the Move to Workspace option to move the window to another workspace. Press Ctrl+Alt and an arrow key to switch between workspaces. 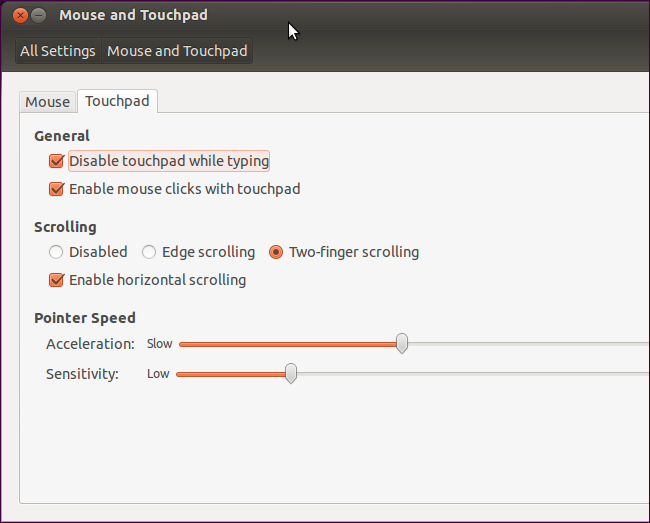 If you have a laptop with a touchpad, there are a few tricks you can generally use. For example, you can move your finger up and down the right side of the touchpad to scroll vertically or along the bottom edge of the touchpad to scroll horizontally. You can also tap at the lower right corner of the touchpad to perform a right click. Depending on your distribution, you may have to enable some of these options yourself – and they may not be available in a graphical user interface. Do you have any other tricks to suggest? Leave a comment and let us know about them!